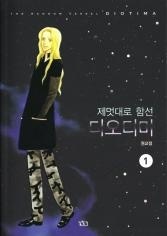 This manhwa deals with lives of a captain and her crew on a space vessel named "Diotima". Diotima is set in 2092, far in the future. This manhwa is considered sci-fi for that. However, the manhwa's plot is "life". In other words, this is one of very few life manhwa. The episodes involve lives of captain Namer Joon and her crew onboard the space vessel, Diotima. The plot goes a little further and tries to convey conflicts between Earthians and Moon settlers. There are clearly some mysteries about Namer Joon, Diotima, and its creators.